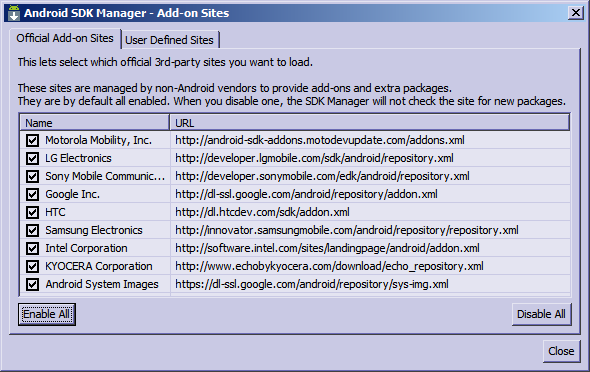 The SDK Manager in Tools r20 has two new features frequently requested as feedback. It caches the small manifest xml files that describe which packages are available. The cache is only for these small manifest files and does not store any of the large install binaries -- these are downloaded on the spot, installed and then cleaned away. The cache is stored in ~/.android/cache or X:\Users\username\.android\cache. When the manager starts, it first does a first pass using whatever it currently has then it tries to do a second pass updating cached XML files if they are older than 10 minutes. The result is that in most regular usage, the manager loads a lot faster and you can start using it right away even if the refresh pass hasn't quite finished yet. It uses conditional HTTP ETag/Modified headers if the remote server supports them. In Tools > Options (or Menu > Preferences on Mac) the user can see the cache size, disable/enable the cache and or empty the cache. 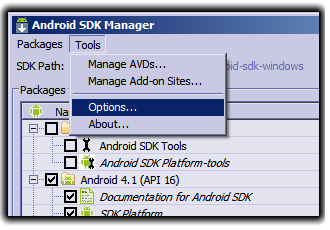 Command-line users can run "android --clear-cache sdk"
The manager also has a revamped Tools > Manage Add-on Sites dialog that incorporates also another often requseted feature: the dialog allows you to enable or disable third-party sites individually. When a site is disabled, its manifest XML file won't be loaded. Any already installed package will still be listed as usual but you won't be notified of updates and any new addon or extra packages will not be visible in the package list of the SDK Manager.